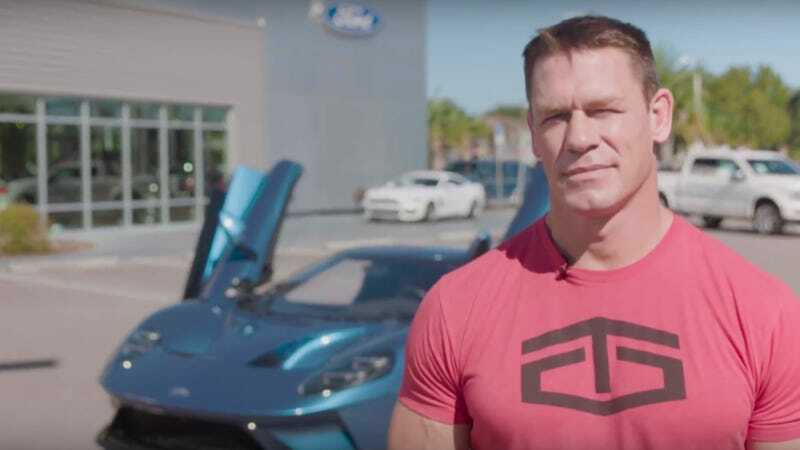 On Tuesday, pro wrestler John Cena filed a motion to dismiss Ford’s lawsuit against him for reselling his one-of-500, $463,373 Ford GT before the 24-month no-resale period was over. While Ford has documents that Cena signed that say he agreed not to resell the car, Cena hopes to dismiss the lawsuit because he claims that stipulation was not put into his final buyer’s agreement. Ultra-rare supercars are routinely resold for much higher than their initial sale price—a fate Ford had hoped to avoid with the new GT. Instead, Ford hand-picked buyers who they wanted to be seen in a new Ford GT, and whose ownership of the supercar would in turn promote the brand. Ford and Cena agreed that any resale restriction would be in the selling dealer’s sales agreement. Ford failed to cause its selling dealer to include any resale restriction, so Ford has no claim. Cena’s sales agreement for the car with Elder Ford of Tampa reads like any standard dealership sales agreement. It’s a form with specifics on the Ford GT added by the dealership staff, complete with lines that don’t apply to Cena on used car sales, trade-ins and other common dealership scenarios. Nowhere does it mention Ford’s restriction against reselling the car for 24 months after delivery. This seems to put the blame on the dealer for not adding in the no-resale clause, even though Ford went out of their way to mention it in the order confirmation and affidavit of eligibility and release that were signed by Cena. The no-resale clause was also included in the terms and conditions for the Ford GT program, which were also entered as evidence when Ford filed their lawsuit. The judge will now have to determine whether this final sales agreement, dated Oct. 12, 2017, precludes the earlier agreements Cena signed with Ford that mention not reselling the car. The full text of Cena’s motion to dismiss can be read below.